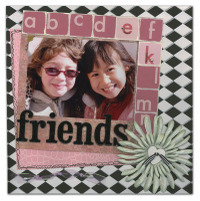 Forgot to mention that I'm going to run Kristi's Dollar Scrapbooking booth at the CK Valley Forge Convention July 28-29th. I need helpers, so if you're attending the convention or you know someone who is going and might like to earn some spending cash, e-mail me. I also need helpers on Thursday to set up the booth. That's Hi . . .yuh, where the "yuh" is hip for "you". That's not Hi . . . yaw, where I'm giving you a karate chop to the jugular. Just thought I'd clarify. I'm nice like that. Plus I don't know karate. 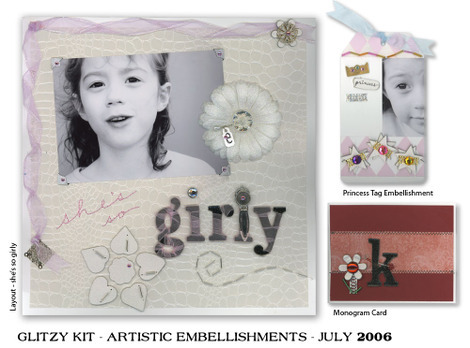 Anyway - I just had to pop in and plug this super-cool (and super, cool) embellishment kit club run by Alana Martinez called Artistic Embellishments. (No need to Google - I'll link ya in a l'il bit). 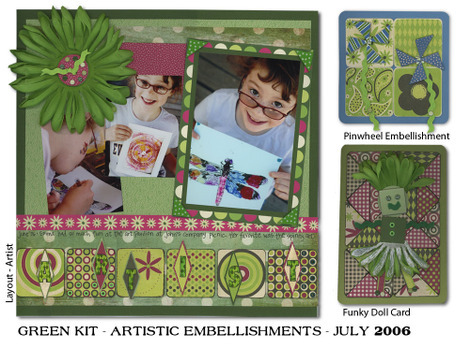 She asked me to be a guest designer for her July kits and let me just gush on . . . The kits are AWESOME! She has combined elements in unusual but inspiring ways. You get all these little hoohas that are just begging to be altered . . .or used as-is. I know, weird! Plus there is a lot of value for the price - really cool current ultra-neat-o-bandito stuff. So here's what I created. You can see bigger versions with tips, supply lists and instructions if you click the link at the end of the post. Yes, there's a reason for my post title, but it has to do with story #2. First, I must post a circuit update. Today was the last day of summer school. Karl launched his bottle rocket three times and it was one of the few rockets that didn't fall apart. Why, you ask? Because he used an entire roll of tape to put the thing together, that's why! I'm sure you've discovered his deep and dividing interest in tape. Presently he's writing the definitive work on the subject. Heh. Karl also yanked out his front tooth last night, so he's looking very hillbilly at the moment. Emma's two front teeth have been mildly loose for some time, but she's not a wiggler. Karl, by contrast, hones in on a loose tooth like a lion stalking a wildebeest. He wiggles non-stop until the tooth comes out. Emma, upon discovering that Karl had successfully removed his tooth and collected a dollar from the Tooth Fairy, suddenly converted to Wiggleism. The Fairy is going to get a work-out at the house of B this summer, methinks! I belong to this delightful little group of Colorado scrappers who try to get together once a month to crop. Last Sunday we met at a local store to crop the day away. At this particular store you are allowed to run a tab while you crop, but you must sign in with your name and contact info and then you are assigned a number. Evelyn, Sandy and I filled out our forms and turned them in at the counter. The employee then noticed my name. "Hey, isn't that the name of that super famous scrapbooking person?" She said with a smile. Now here I must pause to lament the limitations of the spoken word versus the written word. You can't always tell where the punctuation is supposed to go. So I don't know if she was saying I was super dash famous (super-famous) as in really, really, really famous, or if she was saying I was super comma famous (super, famous) as in listing my traits, which included being super and being famous. But none of that matters because she had me at "Hey". Recognizing my name, when I'm really only huge in Europe, is compliment enough. So I laughed a hopefully modest little twitter and said that yes, it was. "Boy, your friends must razz you about that all the time!" she then said, giggling. Evelyn and I laughed some more and then it hit me. She didn't think that I WAS the super-famous scrapbooker. She just thought we shared the same name! "Well, that really IS me, you know." I said, through giggles. We were all still laughing jovially. So I walked away, still puzzled if I had interpreted that situation correctly, and snagged Evelyn and dragged her from the counter to ask her. She confirmed what we both thought and then we started laughing so hard that my stomach hurt and my eyes watered. Sandy returned to the crop room and said that once we'd left the counter she leaned in and explained that I had the same name as the super-famous scrapbooker because I really WAS the super-famous scrapbooker. It would have been nicer if she wouldn't have told her, though, because the lady was really quite nice and felt very sheepish and came and apologized to me later, which wasn't even necessary, since I got a day's worth of amusement from it. So thank you, B, for working my stomach muscles. They needed it! My Americana collection was actually on display at the front of the store, which was rather thrilling, I must say. Quitting with a hit collection is very Everybody Loves Raymond of me, don't you think? Sorry for the sporadic posts. Hopefully now that summer school is over we can get down to the business of, you know, being LAZY. Heck, I'd settle for being HOME! See what I did there? McVet used to be McRobin. You dig? OK, I totally have a funny blog post coming. I thought it would be tonight, but I have to finish up my projects for my guest designership (is that a word?) for Artistic Embellishments before I can get all distracted with bloggity blogging. There are updates on circuitry and a crop report coming (corn futures looks good) tomorrow morning, 'kay? But what I'm McFreaking out about is this: CLICK AND SEE! Oh.My.Gawsh! That is so cool and I am so flattered and just OH.MY.GAWSH! Michelle . . . you have made my YEAR! MWAH! Didn't I JUST recently explain why electricity is scary and not to be trifled with? Because I think I did. I believe I did just that. ELECTRICITY! Science experiments that you can do at home! By the way, I've heard that there was an earlier working title to the book - ELECTRICITY! Your mother has too much money and not enough to do all day! but they went with the more politically correct one. Anywho, Karl comes home with this book and suddenly it's all he can talk about. He MUST create electricity or he'll DIE! And I, of course, want to create electricity about as much as I want to have a root canal. Only that's not a good analogy because I would love for Dr. McMeltMe to give me a root canal. So finally I concede that I will buy the necessary components for a SIMPLE CIRCUIT, but I am not, I repeat AM NOT, going to buy zinc and copper strips to stick into a lemon. I must draw the line somewhere. Line . . . meet sand. So yesterday while Emma was at a friend's house, Karl and I went to Lowes. A little hardware store would have been better, but we don't have a little hardware store anywhere near us. We DO have a couple of super-sized Lowes and Home Depots, though, which probably explains why we don't have any little hardware stores. But this isn't a post about the big guy choking out the little guy so let's all just table our righteous indignation and get back to my amusing story, shall we? Our supply list included: plastic-coated wire, alligator clips, a small light socket and bulb, and a 6-volt battery. Unfortunately, the electrical aisles at Lowes are not geared toward little boys and science experiments. Not in the least. If I'd been smart, I would have called Ev, who taught middle-school science for many years and would have given me the excellent money and time-saving advice to chop up a string of Christmas lights, as she did later that day when I called her in frustration. But I didn't think to call Ev. Instead I relied on the fact that I'm a reasonably intelligent adult who can read English packaging. Oh, and I have an engineering degree, although not Electrical Engineering, which will soon become painfully obvious to everyone reading. Lowes apparently doesn't have a roaming Electrical-Aisle-Helper. You know why? Because electricity is not to be trifled with, that's why! It should be left to the *&%$#^ professionals and the stupid authors of ELECTRICITY! 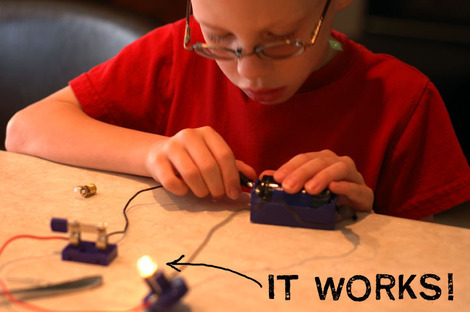 Science experiments that you can do at home! can just bite me! After roaming, and reading packaging that was in English but still seemed like Greek, I quickly crossed off alligator clips. We could just use paper clips, I reasoned. Next I crossed off the 6-volt battery. They weren't in any of the battery endcaps that pepper the store and I didn't feel like tracking down the "obscure battery" section. We'd just use a 9-volt, or a D, or I'd buy the battery at the grocery store, where they group all batteries together in a surprisingly logical and non-frustrating way. But I really needed that small light socket and bulb and the plastic coated wire. They sell wire by the spool, not by the foot. $6.99 was the best I could do and the wire is all professional with about a million little wires wrapped into one big wire. Geez. Talk about overkill, but whatever. It's wire. Check. They had NO little hobby lights anywhere. We searched. I was getting frustrated. Finally I figured we'd just buy a regular full-sized socket and wire it up. I vaguely considered that a 6-volt battery wasn't gonna cut it, but hey - a socket costs $2.46 - might as well try. Check. I did find the 6-volt battery in the *gasp* battery section of the grocery store later. $5.99 for the cheapest generic brand. Check. Home again, home again, hastily shove groceries in fridge, jump back into van to fetch Emma, swing through Taco Bell drive-thru for cinnamon stick snack to make up for completely forgetting that Karl was promised a Frosty for good behavior, and then back home again. The kids were off getting dressed for tee-ball as I sat down to start assembling the circuit. I didn't have wire strippers, so I had to risk chopping off a finger to saw through the plastic coating with a paring knife. Luckily, all fingers are all still accounted for and nick-free. I'm stupid, but amazing safe at it. Karl helped twist the wires around the socket and attached the paper clips to the battery. Did the light bulb light up? Even weakly, as I hoped might happen with my miserable little power source? My sources say no. Of course not. That would be . . . . kind. 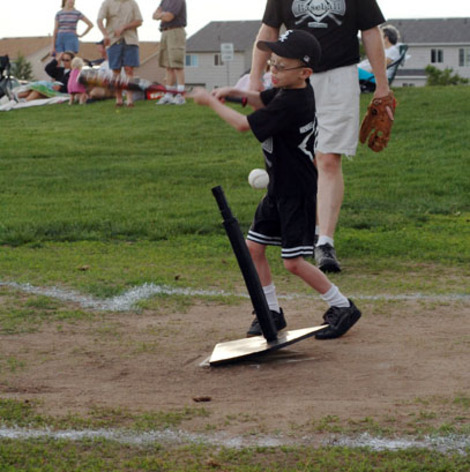 Karl didn't even have time to be properly disappointed because we had to high-tail it to the tee-ball game. Later John checked out the fine print on the light bulb and told me I was 114 volts short. Yeah. That probably should have been obvious. And, like I always say - what's $15 when you can spend $25?! Because you know we're going to be chopping up some Christmas lights today to make the "simple" circuit work. Simple, my posterior! Did I already tell the authors of ELECTRICITY! Science experiments that you can do at home! to bite me? Just checking. Did I use any exclamation points? Here are a few: !!!!!!!!!!!!!! Oh geez. I promised the kids a trip to the library, so I'd better get off this computer. They are, at present, listening to my iPod using a headphones splitter. Have you ever heard an off-tune top-of-their-lungs duet of Rich Girl by two almost-8-year-olds? Oh, well you haven't LIVED, then! And now I really must run to the library, where I will be steering Karl clear of any science experiment books. (Or books about how babies are made, if you'll think back to previous library fiascos) In fact, I would pay extra taxes to have a whole section of the library be completely devoid of any books that require parental involvement. Library books are supposed to occupy the children so that mommies can ignore the little darlings guilt-free. (Hey, they're READING!) This is how mommies find time to update their blog, or e-mail an old friend, or surf the internet, or scrapbook, or re-watch Benji and Donyelle slay the competition on So You Think You Can Dance. You know - VITAL THINGS! Good Mail Day! Good Male Day! Don't you just love good mail days? 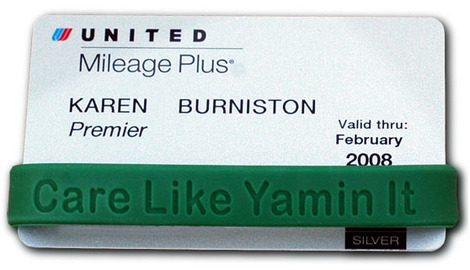 This week brought not only my "Care like Yamin it" bracelets (proceeds to support diabetes). . .
Side note: obviously John, Karl and Emma don't care about diabetes since they won't wear their bracelets! Harrumph! That's right! No more slumming it back in Economy for me - I'll be stretched out five extra inches in Economy Plus! Seating Area 4?! Fuggetaboutit! It's Seating Area ONE with a golden boarding pass for me, folks. Does it show? Do I just give off a "Premier Flyer" vibe? Because I think maybe I do. I'm just sayin'! I'm a happily married spud. I'm a happily married spud. 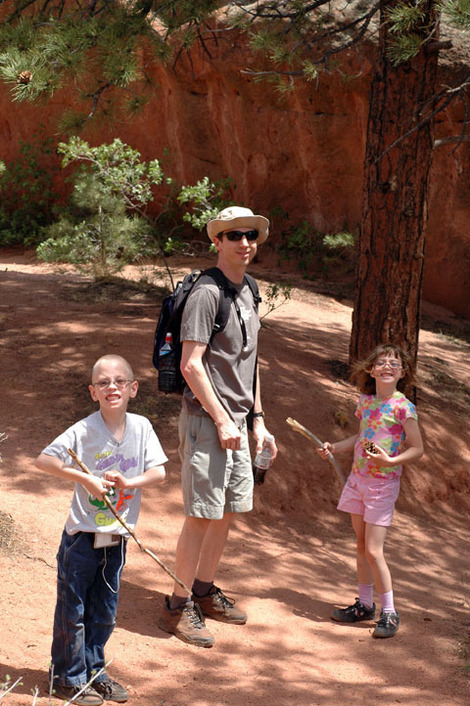 Summertime, and the bloggin's . . .
. . . really not so easy. Nope, not so much. Because we're busy, busy, shockingly busy, that's why! And what are we busy with? Well, first of all, we've got tee-ball. 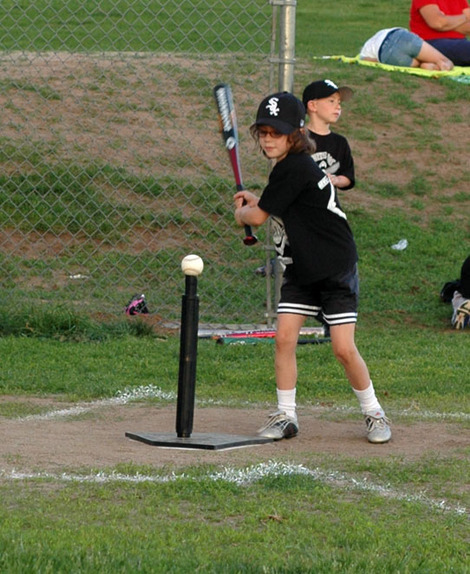 Both Karl and Emma are playing tee-ball this year for the first time ever. Now I wouldn't describe either of my children as. . . what's the word I'm looking for? Oh yes, athletic. Emma has tried all sorts of things - gymnastics, soccer, basketball, even ice skating, but nothing has particularly inspired her to . . .what's the word I'm looking for? Oh yes, pay attention. Heh. Karl hasn't shown any interest in sports since his first day of soccer practice at age 5, when he discovered that he wasn't in charge, threw a royal fit, and spent the rest of practice, and every practice after that, happily picking grass on the sidelines. Forty dollars . . meet toilet. Toilet . . . meet forty dollars. 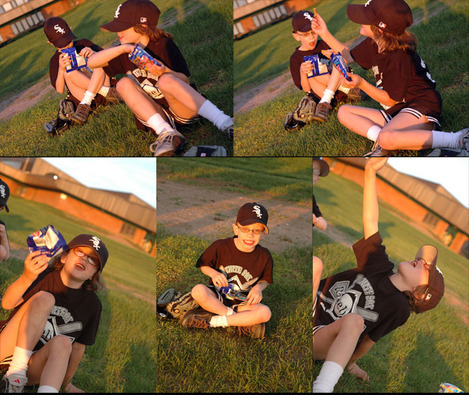 But this year they both perked up at the idea of baseball, so we signed 'em up. They had a couple weeks of practice and now it's game-city every Tuesday and Thursday night throughout June and July. And by "game" I mean one, maybe two, excruciating innings where every kid gets to bat and very few outs are made. 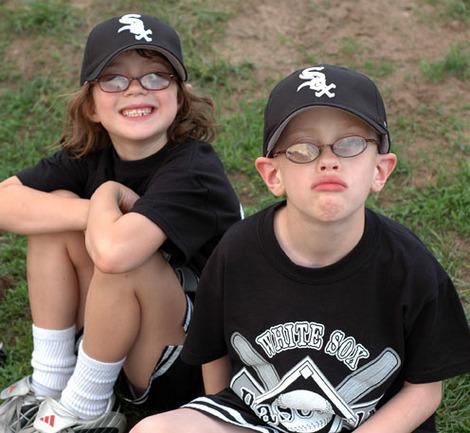 Karl and Emma's baseball knowledge and skills are not particularly distinguishable from any of the other kids on the team, save one or two ringers, and that, my friends, is scary. SCARY, I say! So here they are last week all excited for their first game! Yes, a picture really DOES say a thousand words! Because Karl was not happy. He was moping and complaining and being a general sad sack. Luckily we were up to bat first, and Karl rather liked the idea of batting. So Karl "ran" to first base. And by "ran" I mean sauntered in a slow jog. But of course he made it in plenty of time because all teams in the league share the same general skill set. I was standing out by first base in an effort to startle Karl off the base as soon as Emma hit the ball. I'm thinking of investing in a particularly loud bike horn, or maybe a squirt gun. Not sure. But I digress . . .
Emma actually looked the part, I must say. She went right out there and took a nice solid swing at the ball, got a respectable hit that apparently made the lady in the denim shorts faint in surprise! They limit these games to an hour, quite shrewdly, and nobody keeps score. It's just for fun. And for Karl and Emma, the funnest part, even better than batting is . . .naturally . . .
Look at those smiles! Can't you just feel the energy? Maybe if I'd tie a Teddy Graham to the end of a fishing pole and cast it to the next base I'd get something more like running out of them. Hmmm, the possibilities abound . . . But of course I am just joking around. I'm actually quite proud of them for giving baseball a try. 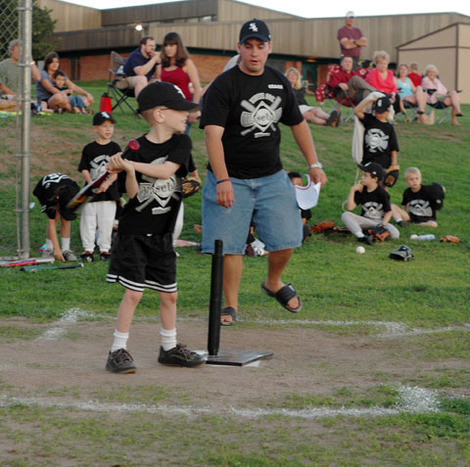 We had some backyard batting practice last night and they both hit a few of John's pitches. Emma says she'll try coach-pitch tonight instead of going straight to the tee. Karl would prefer to stick with the tee, he says. During Thursday's game Emma was forced out at second, so she promptly burst into tears. John and I tried to comfort her while avoiding the urge to say "There's no crying in baseball! THERE'S NO CRYING IN BASEBALL!" After explaining that outs were a part of the game and she did nothing wrong, she perked back up and trotted happily back to the batting line, where most of the team was helping Karl fill his hat with grass. "An anemone is a living creature, not a home for Clownfish!" Emma informed me, thoroughly disgusted with my exclamation of "Like Nemo!" when she mentioned that they had talked about anemones in summer school. Yesterday was the first day. Three weeks of a thoroughly fun education for them, and peace for me. Emma is enrolled in "Wild About Animals" - they're starting in the ocean. Karl is enrolled in "The Physics of Toys" and will make a bottle rocket on the last day. I am enrolled in "Drink Diet Coke, update my blog and ignore the dishes because the kids are gone for a few precious hours." Sunday afternoon we returned from my mom's house. She kept the kids for me while I was in Seattle. The kids had watched a movie all the way home and begged to be allowed to finish it when we pulled into the garage. I left the keys on auxiliary and headed inside for a rest. That night, after listening to Elliott sing the National Anthem on TV (swoon), I headed to the garage to retrieve my bags from the back of the van. . . But the back hatch wouldn't open when I pushed the button because, of course, the kids had not removed the keys from the ignition after the movie. The battery was deader than a doornail. And doornails are pretty darn dead! They're stiff, solid, rusty and, as far as I know, were never alive. The only thing deader than a doornail was, well, my van battery! I told John that we needed to jump start the van, which would require either pushing it out of the garage and down our murderously steep driveway, where it would likely careen into Julie's living room across the street, or clear out all the bikes, scooters, play huts and whatnot on his side of the garage so we could pull his car in next to the van. But then we couldn't find the jumper cables. Finally John was sick of missing his basketball game and said he'd run out and buy new cables after the game and we'd jump start the van the next morning before work/summer school. But it took a while. (Refer to doornail comparison above) For one, the cars were so close together that I couldn't squeeze into the drivers side door of the van, but the other doors were locked and didn't have key holes! I had to recruit Emma to crawl into the van and unlock all the doors. Then we didn't have a good connection and the van would click but wouldn't turn over. The windows wouldn't go down without power, so I found myself yelling through the closed door at John that it wouldn't start. He got out and adjusted the cables and finally the van started. Now normally when you jump start a car the two drivers hop out at the same time to remove the cables. You're supposed to remove them in reverse order, but nobody does. One person takes off one end while the other takes off the other end. But recall that I was stuck in the van and couldn't squeeze out between the two cars. So John removed my cables first. His were still connected to his charged battery and his engine was running. I noticed that he wasn't doing the required "hold the cables at arms length from each other" thing, so I yelled out "Don't let those touch each other!" which made it even worse because he looked up at me and let the cables drop down next to each other. "DON'T LET THOSE CABLES TOUCH EACH OTHER!!!!" I yelled at the top of my lungs. Emma let out a shriek. She didn't know what was going on, but sensed the sheer panic in my voice. Now what SHOULD have happened was for John to realize what I was saying, make a bit of a startled jump, immediately separate the cables, look at me with a grateful sheepish grin, and say "Whoops! Thanks!" But John was late for a meeting. And John had gone out late at night to buy jumper cables in the pouring down rain. And maybe John's team didn't win the basketball game (not sure on that last one - just speculating). So John separated the cables all right . . . but gave me an "Oh puhleeze" look instead of the "Whoops! Thanks!" look that was called for. You know - that sort of lips-pressed-together-one-side-of-the-mouth-raised-eyes-rolling-she's-so-melodramatic look. Oh yes, he did! And I, for one, was furious! How dare he try to blow himself up and then not thank me for saving him! So I crawled out of the van, stormed into the house, and demanded that he acknowledge the DANGER of his careless handling of little metal magnetic lightning rods, suggesting that killing himself in front of his family was in extremely poor taste and may have, you know, scarred the children. He begrudgingly apologized for smirking, but it was the "oh puhleeze" version of an apology. He stomped out of the house grumbling out being late for a meeting and I stomped out of the house grumbling about being unappreciated and then fifteen minutes later the whole thing seemed rather unimportant, as silly arguments often seem once fifteen minutes have passed. I was chatting on the phone with Ev when he came home that evening. He had called ahead to say that he'd be late, and since the kids and I had eaten a late lunch, I decided on "scrounge dinner". Scrounge dinner means anything is up for grabs - you can have cereal, waffles, a sandwich, ramen noodles, mac n' cheese, etc. But I hadn't realized how very late it was until John walked through the door. I called out "Can you make the kids some waffles?" to which he gave me a look that clearly said "Huh? You haven't fed the kids and yet you are going to continue to sit there chatting on the phone with your friend, making me, your hardworking husband, fend for myself AND the children for dinner?" It was a long look. But it was hard to take it seriously since he had a chocolate milk mustache, having just, grossly enough, taken a huge swig from the gallon of chocolate milk in the fridge. Ewwww! I'm so glad I don't drink chocolate milk. In answer to his look I merely said "Hey - I saved your life!" to which he started laughing. Ev informs me that he couldn't have actually blown himself up. Apparently you just get some sparks and a nasty jolt. One time I was vacuuming out the deep end of the swimming pool where I worked many summers as a lifeguard. The vacuum had a frayed cord and the hose was a bit leaky, but teenagers aren't really, you know, bright when it comes to electrical hazards. Consequently when I touched the metal handle of the vacuum I immediately started electrocuting myself. The current was humming through me and I couldn't let go - just like they describe on TV! Nobody seemed to notice my peril, including the Aquacise class consisting entirely of plump elderly ladies all wearing brightly colored old-fashioned rubber knobby swim caps with chin straps. They continued lifting styrofoam "weights" over their heads in a pathetic display of mock exercise in the shallow end of the pool, completely oblivious to the sparks flying off the lifeguard just 20 feet behind them. If I had vibrated my way over the edge and into the pool we would have all been killed, come to think of it. But with an amazing will to live, I wrenched my hand off of the vacuum and sat down to cry. I came to my senses, evacuated the pool and then ran to the ball field next door to find Rick. Rick was the head maintenance guy for the Parks and Rec department. He was also my best friend's older brother and one of the finest specimens of rippling muscles and dazzling teeth ever to grace our small town. Rick was, in a word, IT! Trying to catch my breath from my mad dash, as well as wipe the tears from my grubby face (this was RICK, after all!) I explained that the vacuum was malfunctioning and that I'd almost been electrocuted!!! The rubber-headed Aquacise class didn't seem pleased with me either. But I maintain that electricity is scary, so there! Cat and I decided that we can't go on The Amazing Race if we get lost in her own hometown trying to find a restaurant that was blocks away and we had directions to. Speaking of electricity just one more time, and briefly, I seem to remember that Marlin built up an immunity to the electrical stings of jellyfish because he lived, however improbably, in an anemone. So starts summer in the house of B.
I decided that a playdate was in order so one phone call and fifteen minutes later Patrick showed up, perfectly willing to hang out in said underbelly. Patrick is one of five children (soon to be six) and when I called his mother to verify that he could stay for lunch, she commented that it seemed quiet without him. I was surprised because I wouldn't think removing one fifth of a cacophony would make much of a dent, but apparently I was wrong. Of course, I can't imagine tripling the noise of two children, so my wimpiness remains unshakable. Which brings us to lunch . . . The children had PB&J's, Spongebob Cheez-its, apple slices, peaches and chocolate milk. I had a salad. The conversation turned to babies, and Patrick confided that he hopes that his little brother (if it is a boy) will be named "Spike". As far as I know he's destined for disappointment, but he's got several months to work on his parents, so there's that. "Mom, did you know that it is extremely rare for whales to have twins?" Um hello? I'm eating a SALAD, aren't I? OK, yes, I have put on a few pounds and nobody is less pleased about that than I am, but the "Mom is to whale. . ." word association is Just.Not.Nice. Not nice at all! I threw the rest of the salad away. The bottom-of-the-bowl-drippy-with-dressing-croutons-with-some-clingy-bacon-bits part. OK, I didn't say it was a healthy salad, but I should get points for effort, I think. Which brings me to the point of this post: I have no point. So my last ramble will be about something slightly more serious. My contract to design products for Creative Imaginations under the Scrapperware brand name has expired and I decided not to renew it. It has been a wonderful, educational and thrilling 3.5 years, but I'm closing that chapter of the book. The current market is a tough environment for product designers, especially licensed ones, with the rapid discontinuing of designs - often before a year has passed. To make the effort worthwhile you have to be a lot more dedicated and a heap more talented than I am, with my rudimentary self-taught graphic design skills. Lucy: I know how you feel about all this Christmas business, getting depressed and all that. It happens to me every year. I never get what I really want . . . This does not mean that I won't continue to represent Creative Imaginations - I will teach for them whenever they need an instructor, contribute to their idea books and design classes for their Class-2-Go program. CI is a fabulous company of good people and excellent products and I appreciate the way they gave me, a total nobody, a chance to make a career in this industry. Their faith and support has been incredible. There's something simultaneously thrilling and terrifying about giving up a sure thing to go completely freelance. I hope there will be a need in the industry for a teacher-for-hire. Have class, will travel. Etc., etc. But if not, I will rest easy knowing that this was the right decision. At least that's what I'm telling myself . . . repeatedly!